I would imagine that most of you take a trip to Lowe’s at least once a month if not once a week or MORE! But while you are there grabbing your lumber and tools, you need to take a walk down their seasonal section because they always have fun stuff to decorate your home for the next holiday. Right now they have tons of craft pumpkins to play with for fall and Halloween and lots of spooky decor for those trick-or-treaters. 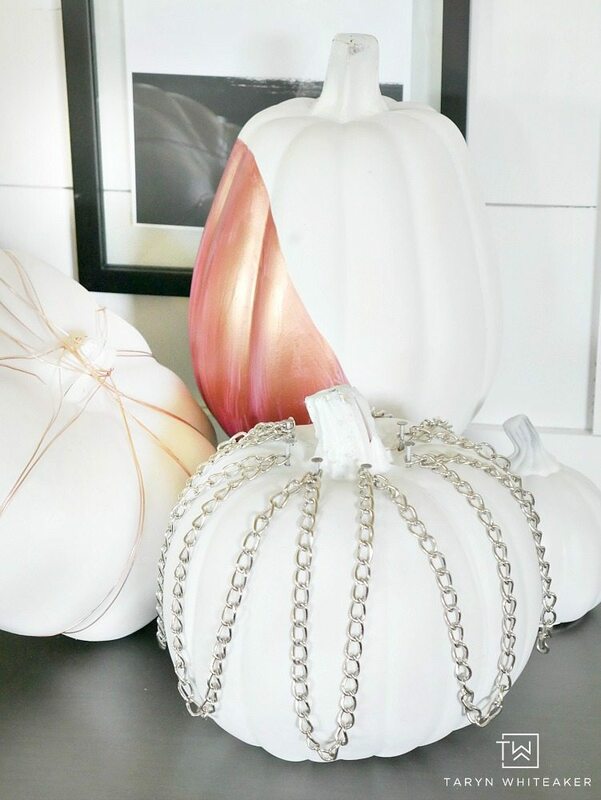 It’s no surprise that I am obsessed with pumpkins this time of year, especially white ones. 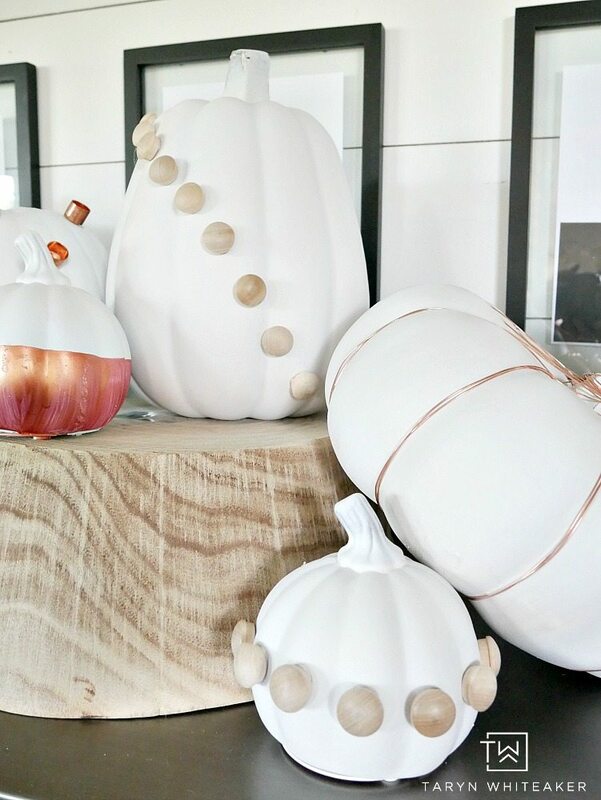 I decided to use a whole bunch of the craft pumpkins at Lowe’s, along with tons of random hardware pieces to create these DIY Industrial Chic Pumpkins. What I love about this project is that everything came from the hardware store and you would never know it! 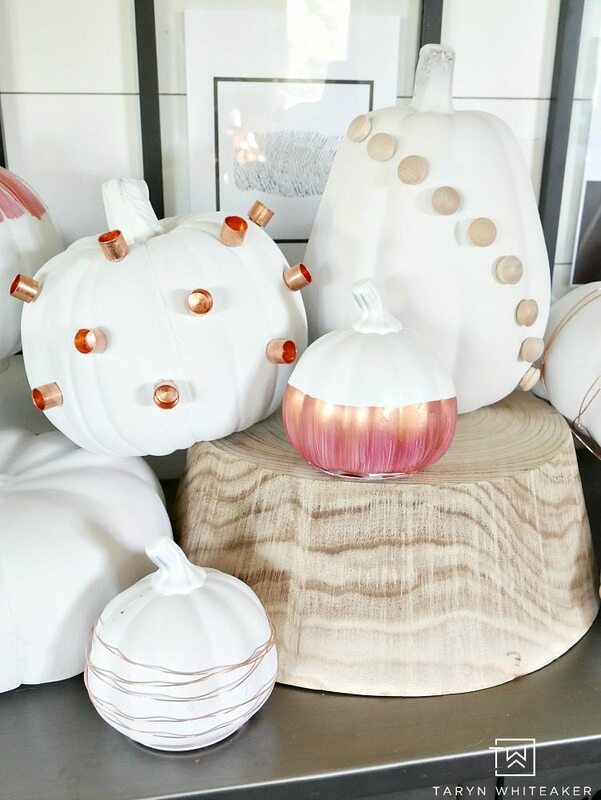 These pumpkins turned out so chic and modern (at least I think so!) and that is the beauty of using unconventional items and thinking outside the box. 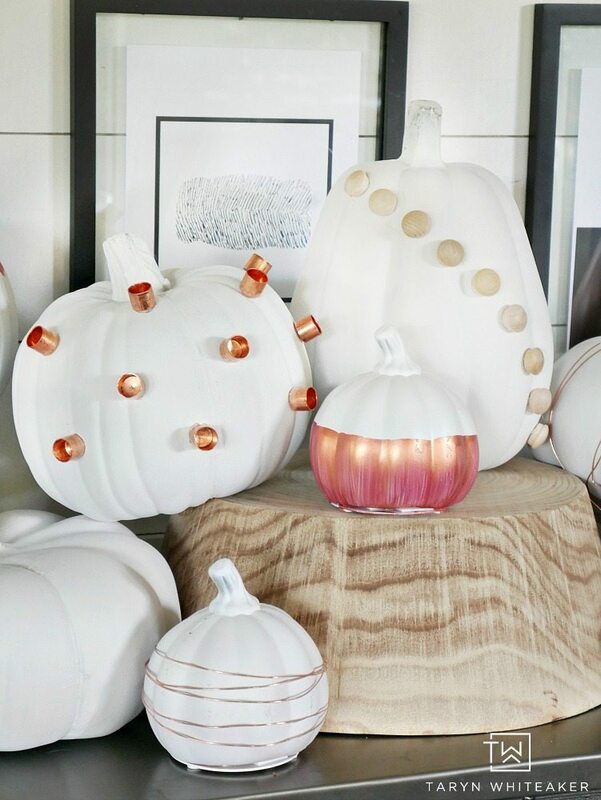 If you are someone who likes more color, you can paint these pumpkins a combination of bright colors for a more funky modern display or black for something more Halloween. 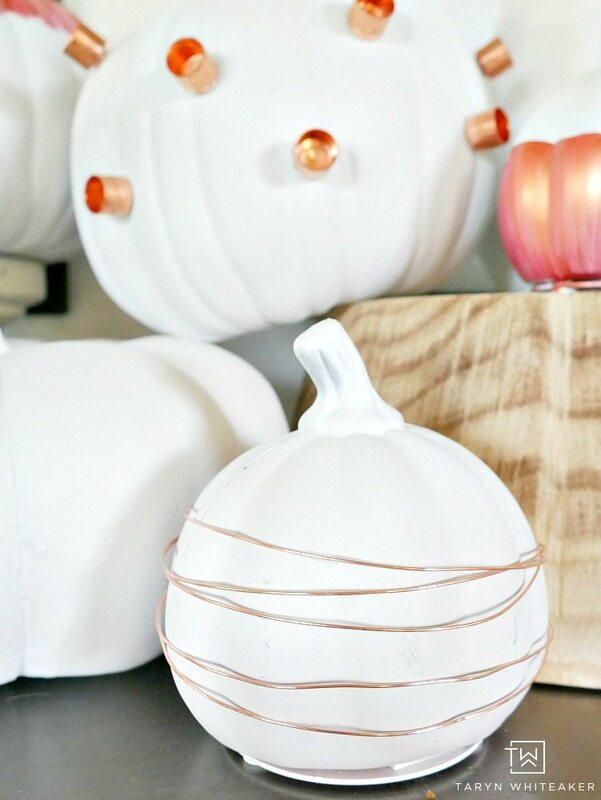 I used Copper Wire for these pumpkins and simply wrapped it around them several times and using a little hot glue to secure the wires together in the back. I tend to use this copper wire for a lot of home decor projects, it’s inexpensive and gives it a really chic industrial look. This collection was really fun to put together and ended up being a really relaxing activity. 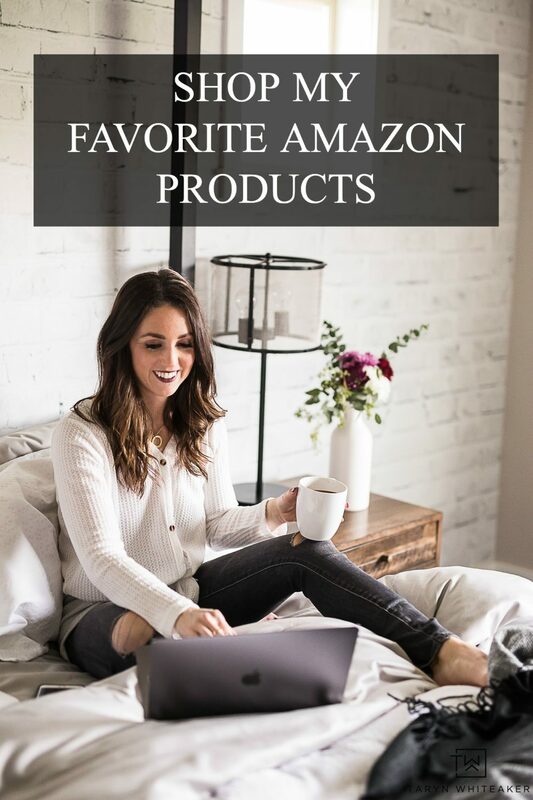 It was a chance to really get creative and is something you could do for a craft night with friends or even have the kids help with some of the simple steps. 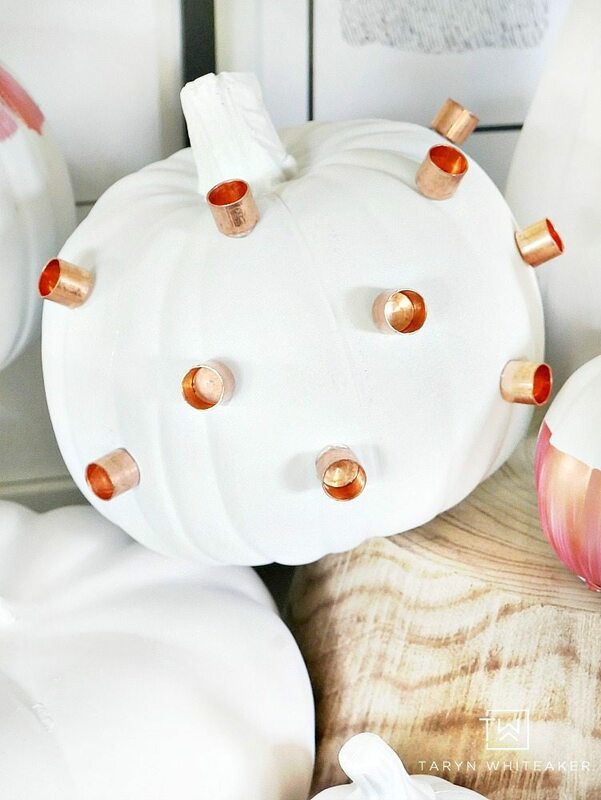 I think one of my favorite products I used were these Copper Caps I love how they add dimension to the pumpkins and look like little spikes. So are you ready to see all of the products I used from Lowe’s to create this? Craft Pumpkins! Below are the sizes I used. I started by spray painting all of the pumpkins white using Valspar Color Radiance in Flat White. I did two coats on all the pumpkins. I really wanted a metallic copper paint for the pumpkins to go with the metals I was using. 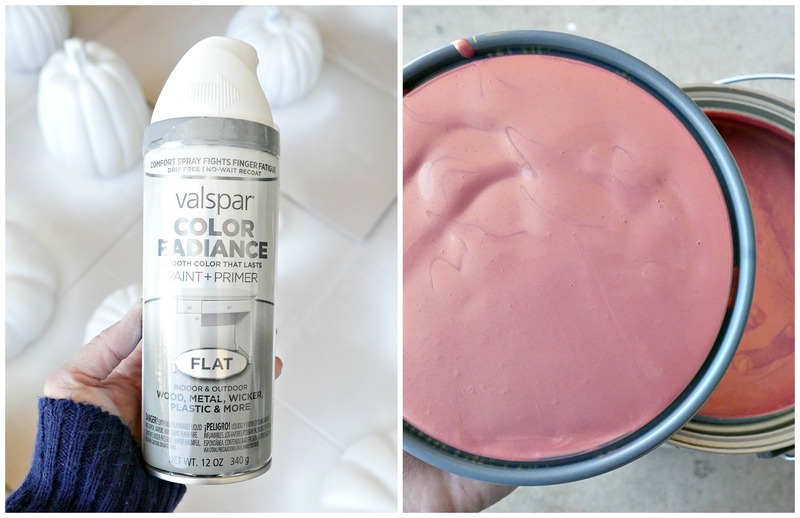 I found out that Valspar makes a Brilliant Metals Metallic Paint and I was so excited. I got it in this Copper Glam color. It has a little pink/red tint to it and it’s so pretty. I love industrial decor and I love working with unconventional materials, which made this project so much fun. I knew I wanted to work with copper, so I searched the store for all of the fun copper materials I could work with. I also added a little metal and raw wood since that is my favorite right now! 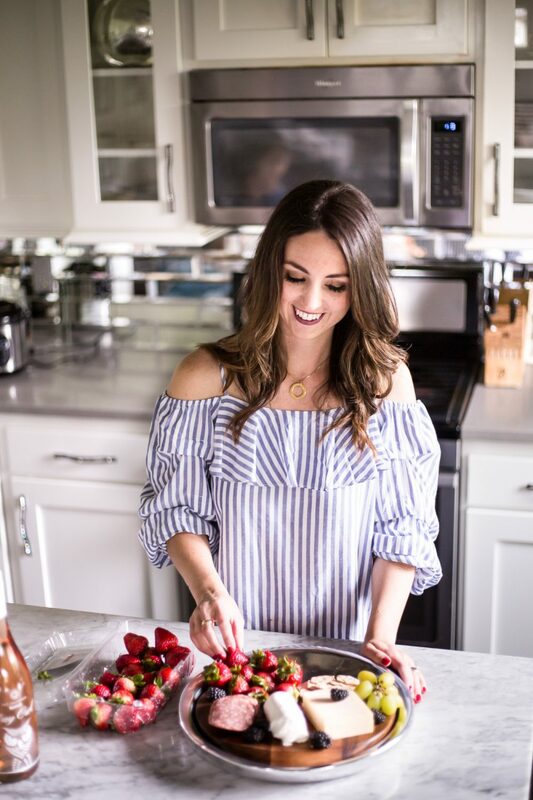 Make sure to pin or share this post to your social media so you can save this idea for later! Also check out Lowes on Facebook | Twitter | Pinterest | Instagram for more great ideas. Most of my fall porch decor came from Lowe’s. They had the best selection of outdoor decor! Your pumpkins are quite interesting and unique! Thanks for sharing with us at Merry Monday. 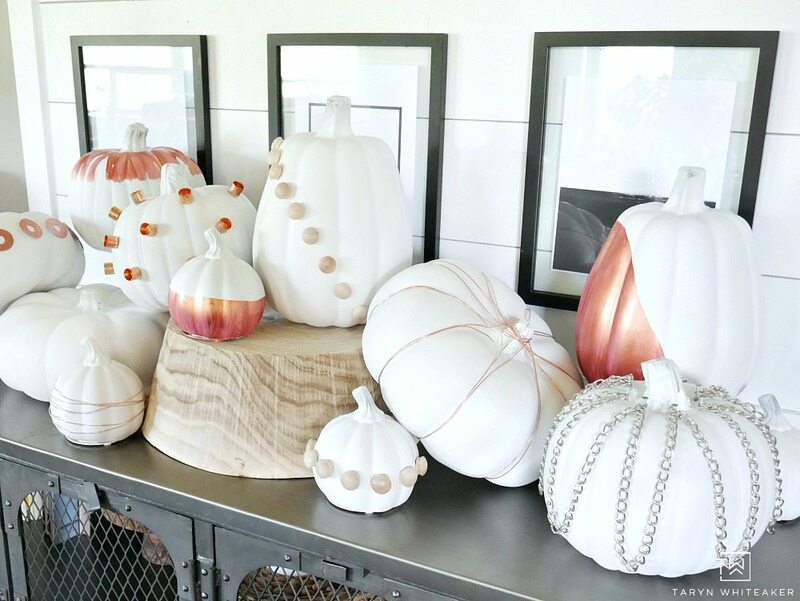 great idea’s love the pumpkins! It’s beautiful and fun project. I also like pumpkins, I had colored my pumpkins with multiple deep colors but never do white color. Actually, white color has a different appeal, just appreciate your idea.